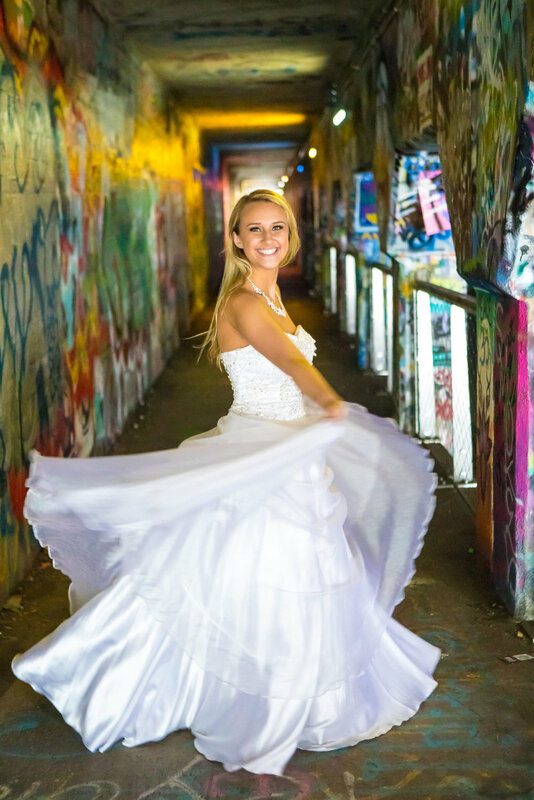 As a Atlanta wedding photographer I am so blessed to live in a city that is full of great photo locations. From the Atlanta skyline to the depth of the Krog Street Tunnel you can't swing a stick and not hit a great photo location. This week I am going to talk about Krog Street Tunnel. It is a great place for a urban sort of photo shoot. It is like a gallery with free art!!! It is alive with colorful art work by Atlanta artists. It is a inspiring and creative place for photographers. It provides a unique color backdrop for all your photo shoots! The Tunnel is constantly being up dated with art! So if you shot there last week it could be totally different the next week. It is like a canvas tunnel that is completely covered in graffiti from small tags to huge murals. The other part of the Krog Street Tunnel is that is in the heart of Inman Park and Cabbage town. These two locations have been historically a haven for artists in the Atlanta area. I remember when I first moved to Atlanta being amazed by " Panorama Dave's" photographs of the area. (please look him up!). Now it has evolved in to creative mecca for for food, art and life! If you have been following this Atlanta wedding photographer's adventures you know that I am all about the light. The street south of the Krog Street Tunnel goes east and west. Which makes it a awesome location for photography in the morning or evening. You can back light a brides veil and dress to give them at heavenly look. Thank you so much for visiting this Atlanta wedding photographer blog. I would love to hear from you. Please go to the contact section of the website and drop me a line. I would love to hear from you! !